Here is another great recipe from my Auntie Gladys. 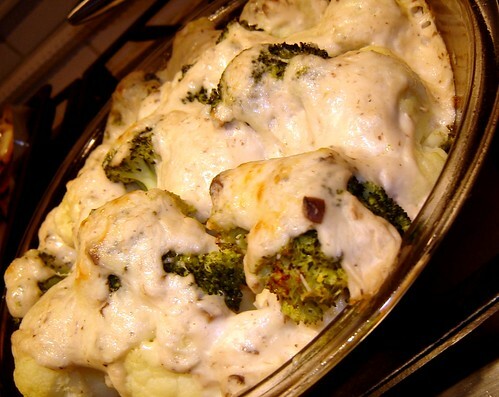 It was the best way for my mom to get us to eat broccoli and cauliflower! The original version is great, but if you want a lighter version, it can be adjusted. Preheat oven to 350 degrees. 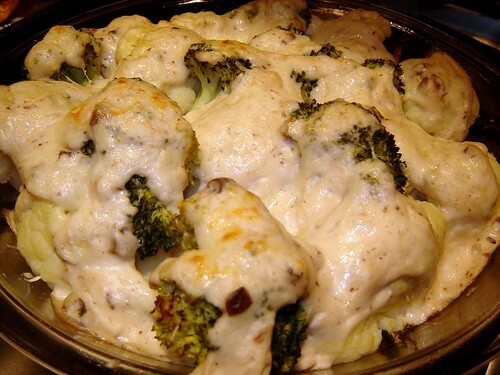 Arrange broccoli and cauliflower in a greased 9 x 9 casserole dish or a 9″ pie dish. Sprinkle with salt and pepper. In a bowl, whisk together condensed soup and sour cream. Pour this mixture over your veggies. Sprinkle with parmigiano reggiano cheese. Bake for 30 minutes, or until veggies are tender and sauce begins to turn golden brown.